Cris Martin started playing the guitar aged 16 after borrowing a classical nylon-strung acoustic from his brother. He read a couple of “how to learn to play guitar” books and also began to listen to albums from his favourite bands at the time, which were Thin Lizzy, Iron Maiden and Black Sabbath to try and work out and copy the guitar parts. Cris spent several hours a day doing this as well as practicing scales in different keys to improve his mastery, a routine he still follows today. 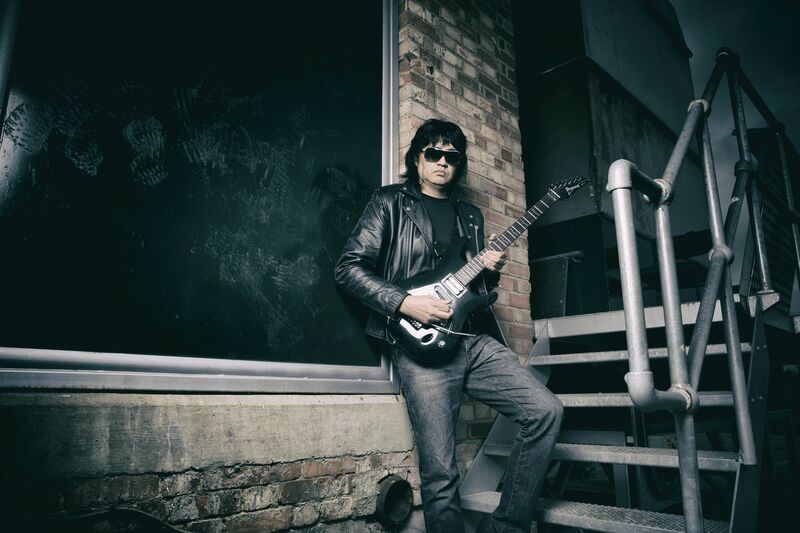 Cris found that he had a talent for playing fast in a similar style to his guitar hero, Gary Moore. After serveral years playing cheap, hard-to-play guitars, Cris fortuously won a sum of money and purchased his first Gibson Les Paul guitar as well as a classic Marshall amp and cab. This allowed him to take his playing skills up to the next level. Aged 21, Cris joined his first Pro band Thunderstick and recorded two albums and an EP which were generally well received. After leaving Thunderstick, Cris did session work at Matrix Studios in London for a while as well as recording an album’s worth of material which was never released. Cris then spent several years in various bands recording, writing songs and gigging whenever he could. In 1997, disillusioned with the Music business, Cris stopped playing and sold all his guitars intending never to play again. Cris took on a number of different jobs and forgot about music altogether. However, in 2008 and after many friends over the years telling him he shouldn’t have put aside his guitar talent, he purchased a guitar curious to see if he could still “shred”. However he was in for a nasty surprise as he realised after eleven years, he could hardly play and he realised he had a choice to either leave it at that or, learn to play again. Cris chose the latter and again began to practice scales and other exercise to try and regain his once formidable technical mastery. Cris began to make progress and briefly joined a rock covers band but he realised this was not what he wanted to do as he had always been in bands where he had composed his own material. He began to think about the possibility of recording a solo album, something he had always wanted to do and in 2013 began recording demos for several brand new instrumental tracks. Cris also had lots of song demos from the 80s and 90s which he wanted to rework and re-record. Cris asked his former bandmate Barry Graham AKA Thunderstick to play drums as well as former Iron Maiden member Blaze Bayley to add vocals to three tracks. The finished product is a stunning slice of classic heavy rock, displays stunning musicianship and compositional finesse and just goes to show it’s never too late to Rock & Roll!